We are the one of the leading manufacturers, exporter and suppliers of a comprehensive assortment of Anti Bacterial products. We are offering a range of Pefloxacin Oral Solution 10 Percent. Oral Anibiotic. A liquid medicated product, peflovet, contains pefloxacin 10 % Oral Solution. THe product is a broad spectrum antimicrobial. 1 ml Peflovet 10% solution in one liter of drinking water for 3-5 days. We are offering a range of Tiamulin. Our clients are offered with another range of medicated product, Tiamulon, containing the contents of tiamulin (45% and 80 %) and is available in different pack sizes. Tiamulin is a bacteriostatic agent, belonging to the group of pleuromutilins. Treatment and control of Mycoplasma infections (enzootic pneumonia, chronic respiratory disease) and porcine respiratory disease complex. It has a synergistic activity with tetracyclines against other primary (A.pleuropneumoniae, B. bronchiseptica) and secondary (P.multocida) respiratory pathogens. is particularly indicated for the control, prevention and treatment of swine dysentery (B.hyodysenteriae), porcine colonic spirochaetosis (B. pilosicoli)and porcine proliferative enteropathy (L. intracellularis). Packaging Details: 1 kg , 5 kgs , 25 kgs or as per customer request. 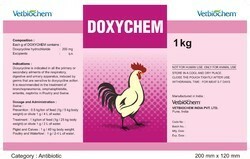 We offer a range of Polymixil (Colistin Sulphate). It is indicated in all the primary or secondary ailments of the respiratory , digestive and urinary apparatus , induced by germs that are sensitive to doxycycline action. 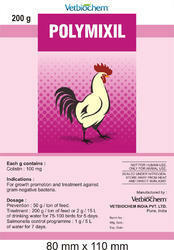 It is recommended for the treatment of bronchopneumonia , omphalophlebitis , enteritis , nephritis in Poultry & Swine . It is effective against drug resistant bacteria causing severe infections like CRD , CCRD , Colisepticaemia , Salmonellosis , Fowl cholera , Necrotic entritis . 8 ml of Levosept solution dissolves in 10 liter of water . For Poultry in drinking water : 4 to 8 ml dissolves in 10 liter of water . +Ve bacteria and is active in both stationary and growth phases of bacterial replication. 0.050ml to 0.075ml Enrosept per Kg body weight in drinking water(2ml Enrosept per 2-4 litres of drinking water) or As directed by registered Veterinary Practitioner. For treatment of Gastrointestinal infections, respiratory infections and urinary tract infections caused by enrofloxacin sensitive microorganism like Campylobacter, E.coli, Haemophilus, Mycoplasma etc. Looking for Anti Bacterials ?